I can’t resist numbers and statistics. On June 8th I reached a milestone when the counter on my blog reached 100,000 views since I began blogging in January 2014. 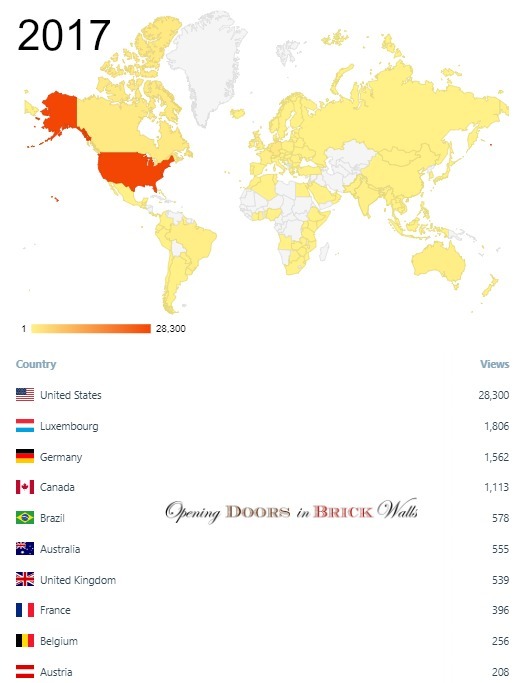 Another milestone came in December when I published my 500th post. The year 2017 was dedicated to my children’s 5th great-grandparents who were featured under the theme of 52 Ancestors in 52 Weeks – a challenge initiated by Amy Johnson Crow in 2014. If you’ve been wanting to “do something” with your genealogy, but it feels overwhelming, Amy will be sending out prompts in 2017. As these ancestors were for the most part from Luxembourg, hundreds of civil and parish records were consulted. Because of this time-consuming research, I did not fulfill my goal of completing the series in time for the New Year. Three sets of great-grandparents’ stories will be written during the month of January 2018. As a service to the African American community, I met my goal of writing one post a month for The Slave Name Roll Project. 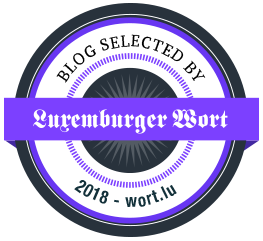 There were also miscellaneous posts written to help other researchers including a post about Luxracines’ visit to the State Archives in Arlon, Belgium. I wrote about one third fewer posts in 2017 as in 2016, 88 compared to 129. During 2017 the quality of the content was considered more important to me than quantity. 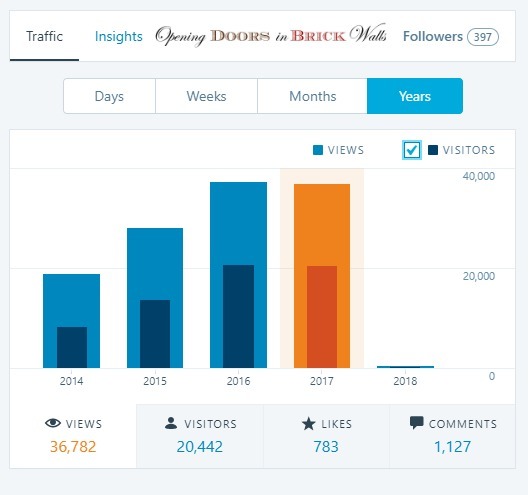 20,442 viewers visited my blog during 2017, 58 less than in 2016 when the number was 20,500. Total views were down by a very small 263 as compared to the total of 36,782. These numbers are not the most important statistics. Nearly twice as many people are following me. An increase from 203 to 397 – which amazes me. Visitors came from 122 countries compared to 98 in 2016. The USA and Luxembourg remained in 1st and 2nd place. Germany and Canada switched 3rd and 4th places, Brazil moved up from 7th to 5th place, and Austria slipped by Ireland to make 10th place. Extra! Extra! Read All About It! The 1766 Luxembourg Census is Online! 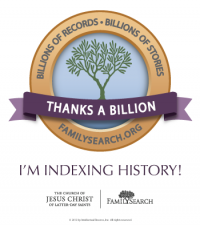 Posts on finding records on FamilySearch were popular as can be seen by #1, #2, and #9 in the Top 10. Thanks to people sharing on social media, half of the Top 10 were posts for the Slave Name Roll Project. None of my 52 Ancestors posts made the Top 10. This was not a big surprise as I knew from the beginning that they were for my children and family and not intended to draw views although they received many likes and comments. I’m going to leave this question open until my Blogiversary on January 23th. I want to finish up the planned posts on my Frisch-Huberty family of Capellen, Majerus-Cornely family of Strassen, and Trausch-Hames family of Mamer. As many of my readers know, I will be spending more time on DNA results. I am still mulling over a few ideas. Thank you to all my readers and followers for making 2017 such a wonderful year! Wishing you success in your genealogy research and blogging, joy and happiness in your lives. Happy New Year 2018 and may you find new keys to open the doors in your brick walls! Happy New Year, Cathy. And congratulations on a year well spent in service to your family and to other researchers. Happy New Year, Vera. It’s been a pleasure. Looking forward to reading more of your stories on Ancestors in Aprons in 2018. Congratulations on another successful year, and I look forward to sharing with you in 2018! Thanks for all your help in translating German records for me. I really appreciate it. Thank you and you’re welcome, Amy. It was a pleasure to help. It helps my own research to branch out into areas I have little experience with. What a great year of success, Cathy. Congratulations! I’m looking forward to reading about your DNA research in 2018. Happy New Year! Thank you, Michael. I got a short message through Ancestry on the 1st from a 4th cousin match (showing as 5-8) who does not have a tree attached and wanted to know how we were related. I recognized his mother’s name (included in the message) and Bingo! They aren’t all that easy but it’s a good omen for the New Year. Thank you, Lloyd. Haven’t been to your blog since you posted this. Will check it out. Happy New Year, Cathy! You had a productive year. I look forward to hearing about your 2018 goal. I wish you a year filled with genealogy goodness and the finding of many, many keys. The year has already started off well with people contacting me instead of the other way around. Thank you, Amberly. I hope your wish for me comes true. Very cool to see Brazil showing up in its statistics. It is a sign of the great admiration we have for your work. Let your sources of research be illuminated and you can bring to light those who fall asleep in the anonymity of our existence. Thank you so much, Miguel. It is much appreciated. I won’t be doing as much Luxembourg research this year but I will try to do some things focusing on Luxembourg. I’ll be following your posts from here! Success there! Everyone is waiting for their work.